There’s a particular sound that even now, 17 years later, feels like coming home. The haunting wail of the silt strider is a mournful herald of safety. They stand on chitinous legs near settlements and towns, howling into the air the message that refuge awaits nearby. When you’ve been trudging for hours through the Ashlands, fending off rabid beasts and winged nightmares, that sound echoing through your computer’s speakers plays like a fanfare from heaven. The Elder Scrolls III: Morrowind comes from a time before fast travel. Before quest markers. Before invisible dice rolls were replaced with physical combat. It was a harsh time, but one that was utterly rewarding in a way that few games or worlds have managed. Let me tell you why Morrowind is important and worth playing today. Born on a certain day. Morrowind is a hard sell. It’s beset by issues that can impede the ability to enjoy the game, issues that sequels in the series have largely resolved. Combat, a core part of the Elder Scrolls experience, is pretty crap in Morrowind. Whether you hit or not is decided by invisible dice rolls, taking into account your enemy’s stats and your weapon skill. This means that the game itself is an abstraction. You might look like you’re hitting something, but unless the game says you are, you’re not. The journal only gives vague directions for your quests, animations and character models are stiff and awkward, and if you don’t choose your skills carefully you’ll find the whole game almost impossible. But none of that matters, not really. Because nothing compares to just the feeling of living in Morrowind, of existing in the world of Vvardenfell. I heard them say we’ve reached Morrowind. Players in 2002 were greeted by a beautiful world – with water with actual reflections – but an alien world, a world unlike other fantasy worlds. Most fantasy worlds are inspired directly by Lord of the Rings and Western. Most of Tamriel, the continent The Elder Scrolls is set on, is the same. Except for parts, areas where the weird shines through. One of these is Vvardenfell, up in the North East, part of the Dark Elf lands of Morrowind. A volcanic island of rich earth and brutal ashlands. It’s a land of history, of deep divides that go back generations. It’s a place where you, no matter who you play, are an outsider. One who’s often unwanted. Giant mushrooms tower over the foetid Bitter Coasts and the lush Ascadian Isles regions. Majestic bull netch and poisonous betty netch playfully float over the scenery. Alit, Kagouti, Nix-Hounds, and the ever-present Cliff Racers make every step out of doors a risk. And over it all, from the Red Mountain volcano hunkering at the centre of Vvardenfell, comes the Blight. A disease ridden wind that blows dust and worse across the island. 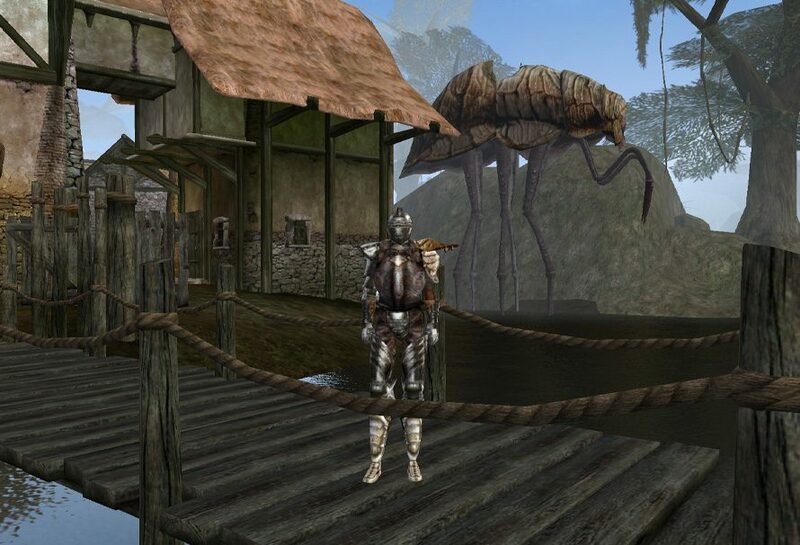 It’s a world unlike any you’ve set foot in, and if you play Morrowind, it’s one that’ll forever be your home. It’s a hard land, a land where heroes are forged. But who are you? The game starts with you as a prisoner, held deep within the bowels of a ship that’s docked at Seyda Neen on the South coast of Vvardenfell. Who you are doesn’t matter in Morrowind. What matters is who you can be. You’re very much a blank slate in Morrowind. Whilst you’re there ostensibly to fulfil prophecy, those who sent you there don’t believe in that prophecy. You’re there for political aims, to keep the grumbling Dunmer in their place. To appear to be the Nerevarine of legend but one under the thumb of the Empire. As such, a large part of the main quest asks the question; are you fulfilling prophecy, or just appearing to? No-one can doubt that you achieve momentous things as the Nerevarine, but do you do them because of prophecy, fate, or your own will? Obviously it’s a video game so caveats apply, if you want to complete the main quest your choices will narrow. But does that make the main quest’s questioning of prophecy a meta question? Is it prophecy, or the designer’s will that drives your actions? Would you kindly take that, Bioshock. Regardless of the main quest, there’s just so much to do in Morrowind. Unlike later Elder Scrolls games it’s often exclusive, and difficult. You don’t join a guild and then find yourself at the head within a week, you have to earn it. And each of those guilds has enemies and allies, meaning your reputation will go up and down appropriately. Joined the Fighters Guild? You’ll find the Thieves Guild more difficult. Joined House Redoran? That’s you locked out of the other two. More than that, you can only choose a certain amount of abilities to focus on. You can’t be a jack of all trades. All this means that you’re actually playing a role. You’re not god, you can’t do everything. Care and attention needs to be paid about who you want to be. Morrowind made a huge difference to my life, and continues to do so. As I get older I find the world of Vvardenfell increasingly comforting to return to, like a pair of old well worn shoes. It’s a harsh landscape and a tough place to live, but with practice and knowledge it can be a place to survive and indeed, thrive in. Despite all its difficulties, despite it being seventeen years old, despite it creaking around the edges, Morrowind is important and still a vast treasure trove of adventure, opportunity, and roleplay. If you’ve cut your teeth on the later games, or just skipped over the clunky cousin to Skyrim, I implore you to give Morrowind a try. You might bounce off it a few times, but persist and the richness of the world will surround you and last with you for the rest of your life.